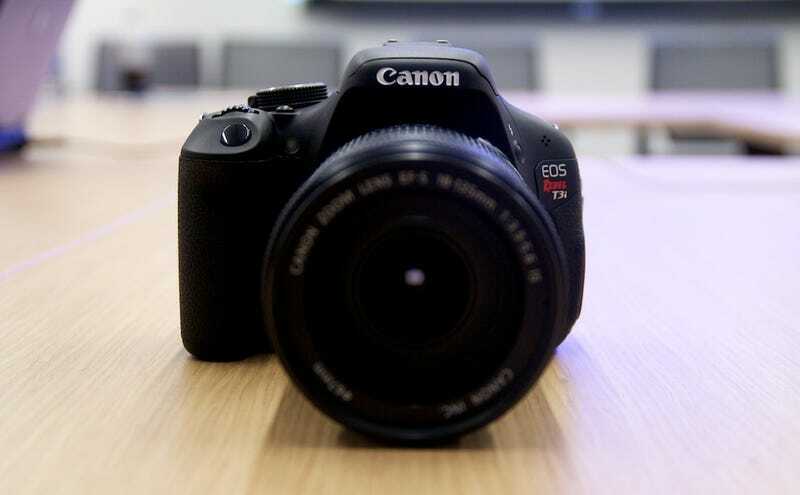 Inch by inch, model by model, Canon is slowly dragging the DSLR toward its destiny: a full-fledged photo-video hybrid camera. We're not there yet, but the $800 T3i brings shooters a bit closer with a video-centric swivel out screen. First thing's first: If you have a T2i, don't freak out. You've still got a killer camera. The T3i has the same blood & guts as its predecessor, just in a spiffier, more video-oriented package that pulls in the swivel screen from the slightly more upper level 60D. It's got the same 18-megapixel image sensor, same focus points, same video specs (1080p @ 24 or 30fps, 720p at 60fps, etc.). I didn't shoot a ton of sampleage because we're talking the same image sensor and guts as the T2i, so the image and video quality should be the same—if it wasn't, the unit was pre-production anyway, so final judgment would need to be reserved for the final product. Besides, it was really crappy out. You can check out the full-size samples here, though. Aaaaand there's new bottom-level camera, the T3, which comes in a $600 kit. It's a relatively bare bones 12-megapixel shooter that also records 720p video. No swivel screen. Personally, I'd save up for the extra scratch for a T2i instead, which is Canon's new middle entry point, sitting between the T3 and the T3i.